Sierra Therapy Group has been providing effective pediatric occupational therapy services to the Reno area since 2008. We would love to meet you and your child and see how we can help! Sensory processing is how we transform sensory information from within our own bodies and the external environment into messages we can act on. Our senses work together to give us a reliable picture of the world and our place in it. Sensory processing disorder is a problem with the way children use sensory information for self-regulation and skill development. Fine motor skills refer to a person’s control over the small muscles of their hands. 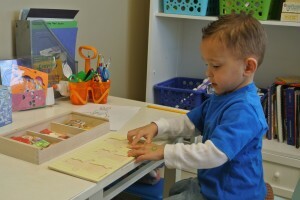 Fine motor skills targeted in occupational therapy services include handwriting, manipulating small objects (e.g. blocks, zippers, puzzle pieces), and dexterity. This area of occupational therapy addresses daily life skills such as dressing, bathing, brushing teeth, using the toilet, eating and drinking. As children get older, we expect them to become more and more independent with these skills. Occupational therapy can help with this process. We enjoy providing parent education and welcome input and questions from parents! Overall, a child’s occupation consists of playing, growing, and learning. Occupational therapy provides children and their families the skills to interact in multiple environments successfully and independently. Some areas targeted include play skills, social skills, eating and drinking, sensory processing, fine motor skills such as handwriting and cutting, and self-care skills such as bathing and dressing. Occupational therapy also provides intervention to allow children to meet their developmental milestones. To maximize children’s learning, we use a play-based therapeutic model. Learning is an interactive process; therefore, we use hands-on activities and games which allow children to participate actively in the sessions. How do you know your child would benefit from Occupational Therapy?